I hope you don’t judge me too harshly for this unoriginal installment of Muffin Mondays. Everyone and their mom’s dentist has a banana muffin recipe, so who am I to add one to the collection? I have no compelling answer to that question, so I’m going to show you a picture and hope that it’ll distract you from judging my boringness too harshly. These are pretty simple, but they’re tasty. 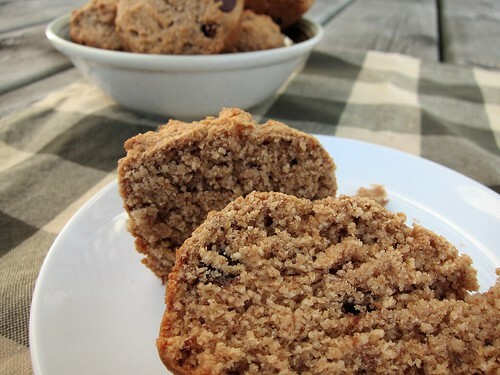 Brown rice syrup gives them a sophisticated sweetness, and a smattering of chocolate chips makes them a little more playful than your standard banana muffin affair. Preheat the oven to 350° and lightly grease a 6-muffin tin. In a medium bowl, whisk the flax into the warm water and set aside. In a large bowl, sift all the dry ingredients together and mix well. Add the wet ingredients and the brown sugar to the flax mixture and stir well, making sure all wet ingredients are mixed. Make a well in the middle of the dry ingredients and pour the wet ingredients into the well. Mix until just incorporated. Fold in the dried coconut and the pineapple. Spoon the batter into the prepared muffin tin – it’ll come up to the top of each well. Bake for 20 or so minutes or until a thin knife inserted in the center of a muffin comes out clean. I’m sorry for posting these so late – I usually draft my posts at night and then edit and publish them when I get into work in the morning, but I hadn’t added the recipe to this post last night, and it was saved on my home computer. Alas! So I had to wait until I got home from work to add it and publish. But here they are! 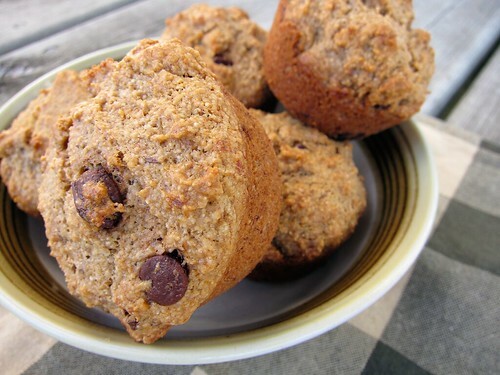 What’s your favorite banana muffin (or bread!) recipe?